FORTUNE -- Representatives of Michigan's film industry sounded the opening salvo last week against a plan by Michigan's new governor, Rick Snyder, to eliminate a generous tax credit for film production that brought over 100 movies to be filmed in the state over the past three years. In his budget, released last month, Snyder proposed to abolish the 42% tax credit for film production, reducing it from unlimited rebates to an annual $25 million cap. 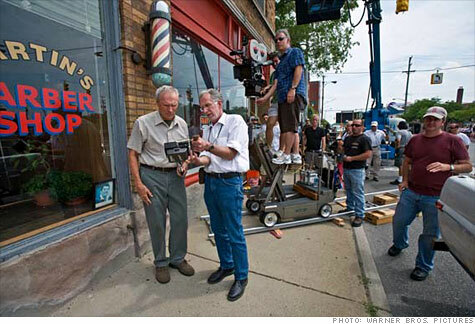 The filming of such big studio pictures as Warner Brothers' Gran Torino, Paramount Pictures' Up in the Air and Next Films, LLC's Scream 4, due out this summer, was in direct response to the tax credit, which took effect in April 2008 and is the highest awarded by any state. It was part of former Democratic Michigan Governor Jennifer Granholm's effort to create new industry in Michigan after the fallout in auto manufacturing sent the state's unemployment rate soaring. Snyder's move has drawn stiff opposition from the local film industry, which fears that the cap would allow only a few major films a year, crippling the infant industry. At a hearing of the House Tax Policy Committee last week, journalist and best-selling author Mitch Albom, an architect of the film tax credits, testified against Snyder's proposal, pointing out that the film and television business grew from $2 million to $225 million in two years, generating new studios, including the $120 million Raleigh Studios, housed in a former General Motors (GM) plant in Pontiac. The incentives spurred a migration back into Michigan. "Schools opened. Video game and digital media companies sprouted," he said. "We were about halfway towards our goal, leading the nation in these young, lucrative, multi-media fields, when last month, the tablecloth was yanked away." While agreements signed prior to the budget proposal are eligible for the tax credit, there are 43 studios with pending applications to film in Michigan. And the Michigan Film Office cannot approve them until a final decision is reached by the legislature, expected in late May at the earliest. "As these applications sit in limbo, the projects involved are seeking out new locations," says Chris Aliapoulios, CEO of Michigan Movie Magazine, which tracks the industry. "The impact of what has already transpired is going to substantially affect thousands of people's income this year -- businesses both large and small," he said. Marvel Studios, which hoped to film The Avengers in Michigan, is now heading across the border to Ohio, which offers a 25% tax credit. It would have received a $10-million tax credit from Michigan and it left because of the uncertainty surrounding it, according to Vans Stevenson, senior vice president, state government affairs, of the Motion Picture Association of America, which represents Marvel's owner, Walt Disney Studios Motion Pictures, and other major studios. Stevenson says that Michigan's tax credit allowed studios to produce with a lean budget. Plus, it proved to be a great working environment. "The reaction from everybody was unbelievably positive," with the state and local governments "bending over backwards" to accommodate film crew requests for shooting locations and road closures, while small businesses eagerly supplied the film companies with goods and services, he said. Blank check or economic investment? Snyder's budget director, John Nixon, says that Snyder isn't averse to attracting the film industry. But he's particularly concerned about having an uncapped expenditure that hasn't been accounted for in the budget. It's like giving the film industry a check and saying "just let us know what the bill is and we'll put the money in the bank," he says. For example, if $1 billion worth of films are incentivized, it would cost taxpayers $420 million, significantly reducing state revenues and making it tough to balance the budget. Instead, the governor would prefer to appropriate a specific amount of money each year, cap it and have a plan in place on how to get the most for the money and create a viable, long-term industry. But a February report by accounting firm Ernst & Young, commissioned by the Convention and Visitors Bureau of Detroit and surrounding areas, found that the tax incentives have resulted in the creation of 2,631 jobs in 2009 and 3,860 jobs in 2010 for Michigan residents. The study found that every dollar spent on the film industry returned $6 in economic activity. Michelle Begnoche, a spokeswoman with the Michigan Film Office, said film companies have infused hefty revenues into the state, spending $641.9 million since the tax credits went into effect, with an additional $147.6 million projected for projects approved for 2011 so far. The state is expected to pay out a total of $361 million in rebates. This activity has positively affected existing businesses, like hotels, while spawning new businesses that sprung up to service the film industry, everything from casting agencies to vehicle rentals and catering services. The governor's office sees thing differently. Nixon says that every dollar spent brings in only 28 cents, not enough to justify such a high tax incentive. Movie and television executives are reevaluating their future in the state. Gary French, senior vice president for production at ABC Studios, says filming the new drama Detroit 1-8-7 in the Motor City "added authenticity to the storytelling and the incentive made it more economical than shooting in Los Angeles." While ABC had a positive experience and would like to return if the show is picked up for another season, it won't if the proposed $25-million cap remains, and is subject to an annual appropriation, since there would be no guarantee that sufficient money would be available. Studios built in Michigan, including the $1.6-million Maxsar Digital Studios which opened 14 months ago, are threatening to close. Philippe Martinez, Maxsar's CEO, says the company was planning to double its staff, hiring another 50 Michigan residents, but is holding off. "We made long-term investments and nobody expected this kind of shocker," he says. If the proposal remains, "we will have to relocate the studio to another state." Matthew Tailford moved from Los Angeles back to his native Michigan three years ago to found 10 West Studios in Grand Rapids, where he filmed five feature films. He just turned down a two-picture deal, since he didn't feel comfortable advocating for filming in Michigan, given the current uncertainties. He's looking to put his house on the market and head back to Los Angeles after pouring "millions" into the local economy. "We were excited about making films at home and that dream is going away," he says.